Anon. sale, Hôtel Drouot, Paris, 20 November 1988, lot 54. Private collection, Switzerland (acquired at the above sale); sale, Christie's, New York, 3 November 2004, lot 54. Acquired at the above sale by the present owners. J. Follain, "Fernand Léger" in Cahiers d'Art, vol. 15, nos. 1-2, 1940, p. 30 (first state illustrated; titled Composition au vase bleu). P. Painlevé, "A propos d'un 'nouveau réalisme' chez Fernand Léger" in Cahiers d'Art, vol. 15, nos. 3-4, 1940 (illustrated in situ in the 1940 Galerie Mai exhibition). G. Néret, F. Léger, Paris, 1990, p. 178, no. 235 (illustrated in color). G. Bauquier, Fernand Léger: Catalogue raisonné de l'oeuvre peint, 1938-1943, Paris, 1998, vol. VI, p. 100, no. 1038 (illustrated in color, p. 101; with incorrect provenance). Paris, Galerie Mai, Oeuvres récentes de Fernand Léger, March 1940. Recklinghausen, Ruhr-Festspiele, Deutsche und Französische Kunst der Gegenwart: eine Begegnung, 1950 (illustrated). Berlin, Französische Malerei und Plastik, 1938-1948, May-June 1950, no. 50 (illustrated). Biot, Musée national Fernand Léger, Hommage à Fernand Léger: Exposition du centenaire, May-September 1981, no. 75 (illustrated). Caracas, Museo de Arte Contemporáneo, Fernand Léger, October 1982, p. 79, no. 51 (illustrated in color; titled La raiz negra and with incorrect dimensions). Léger began painting Grande nature morte in 1938, probably during the late summer, before departing by ocean liner from Le Havre on 15 September, bound for New York. He had twice previously undertaken trans-Atlantic crossings, to visit contacts and clients in various American cities, during September-December 1931 and September 1936-March 1937. Upon his return to his Paris studio in early March 1939 from this recent third trip, he resumed work on Grande nature morte, and then completed it, probably sometime in the early spring. The majority of Léger's easel output during this period consisted of still-lifes such as Grande nature morte; some few also incorporate figures (Bauquier, no. 913; fig. 1). The artist's busy travel itinerary probably accounts for the relatively small number of figure compositions that he painted during the late 1930s, in contrast to previous years. There were however, two such works that consumed much of his time and effort, both executed on a monumental scale: Adam et Eve, and the even more ambitious Composition aux deux perroquets, both of which he worked on between 1935 and 1939 (Bauquier, nos. 880 and 881, respectively; the latter, fig. 2). Following modernist decorative principles, the two murals are fundamentally flat in form and space; Léger even intended the rudimentary modeling he applied in the figures to impart a relief-like aspect that reinforces the shallowness of the ambient space. Composition aux deux perroquets would serve as the paradigm for Léger's monumental art during the remaining two decades of his career, in works which the artist intended to be not only grand in scale, but broadly public in their presence and impact. This was an art that had now taken on a social program, a bold development in the functions of painting that Léger had been contemplating since the early 1920s. Léger now seized the time, and a revolutionary time it was. In 1935 a coalition of leftist and centrist parties, organized labor and intellectuals formed the Front Populaire, advocating a democratically based progressive alternative to counter the growing ascendancy of fascism in Europe. Both moderate and even radical Front politicians controlled the French government during the years 1936-1938. Léger pledged his support in an article published on Bastille Day in the periodical Monde: "This July 14, 1935, will mark a date in the social and national rectification of France... We are coming out of a gray and confused time" (quoted in C. Lanchner, Fernand Léger, exh. cat., The Museum of Modern Art, New York, 1998, p. 138). The emergence of the Front Populaire represented for Léger the advent of a new and potentially transformational social consciousness, and this was precisely the opportunity he had been anticipating that would finally allow him to act on his ideas about bringing modern art out of the studio and into the everyday consciousness of the general public. Léger resolutely advocated modern art as an agent of change, a means capable of communicating to the masses in boldly appealing terms an optimistic vision of a forward-looking socialist society. He possessed unshakable confidence in the innate abilities of the common modern man to respond to art in such ways, which the cultured elite had long withheld from him, that would aid him in ameliorating his proletarian condition and enhance his appreciation of life, nature and fellow humankind. "All men...have in them a potentiality for meeting the beautiful half way," Léger claimed. For its part, art, too, must transform itself, by keeping pace with the accelerating spread of modernity in all fields of endeavor--through what Léger called "The New Realism"--"to compete with the daily allurements of the movies, the radio, large scale photography and advertising." Léger declared: "Free the masses of people, give them the possibility of thinking, of seeing, of self-cultivation--that is all we ask; they will then be in a position to enjoy to the utmost the plastic novelties which modern art has to offer... The working class has a right to all this" ("The New Realism Goes On," 1937, in E.F. Fry, ed., Fernand Léger: Functions of Painting, New York, 1973, pp. 115 and 116). Together with his students and studio assistants, Léger created during the next several years a series of large decorative murals for public display: Accompagnement d'architecture (in collaboration with Gleizes and Survage), Le syndicalisme ouvrier for the Hall d'Honneur of the Pavillon de la Solidarité, to celebrate French social unity, and Le transport des forces (Power Transmission) for the Palais de la Découverte at the Exposition Internationale des Arts et Techniques, Paris, in 1937. For this same exhibition, he devised--in collaboration with Charlotte Perriand, an architect and designer--Travailler, a mural which combined painting and photomontage, celebrating the modern worker. 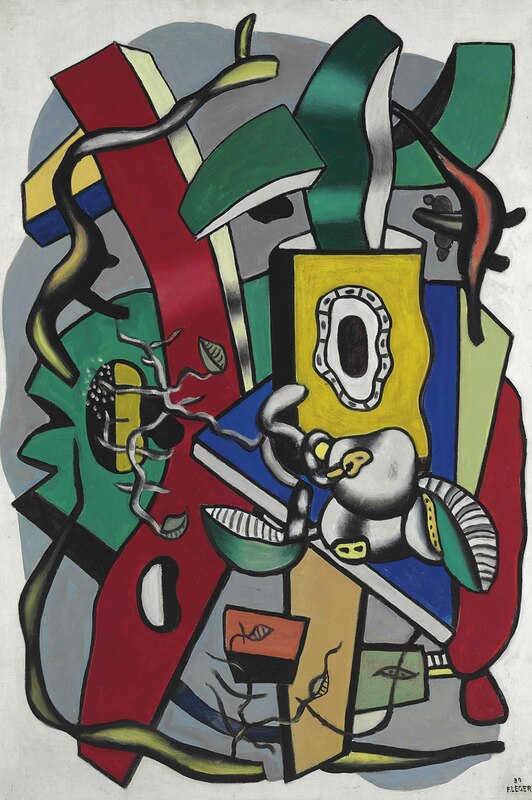 The concurrent concentration that Léger placed on still-life subjects in his easel paintings--such as the present Grande nature morte--had their significant role in Léger's larger socio-aesthetical agenda. He employed such compositions as vehicles by which he could test and verify the effectiveness of various formal means. His aim was the development of a successful decorative approach to the presentation of objects, whether taken from nature, the commercial sphere or the latest technology. He cut loose his chosen objects from the formal strictures of conventional spatial arrangement, and allowed them to float freely but inter-connectedly in space, together with those figures he might employ to accompany them. He intended that this method of composition should apply to all his work, from easel paintings of all sizes and formats to in- and outdoor murals executed on a grandly monumental scale. These ideas also informed the commissions which brought Léger to New York in the fall of 1938. Nelson A. Rockefeller had given the artist the go-ahead to decorate his Fifth Avenue apartment. By the end of the year the artist completed, painting in situ, a sequence of murals adorning the walls of a circular staircase that linked two floors of the Rockefeller residence. He then proceeded in early 1939 to paint a decorative wall piece which surmounted the fireplace in Rockefeller's sitting room (fig. 3), situated across from the Matisse mural La Poésie, 1938. Léger's enthusiastic patron thereafter commissioned him to provide a roof design for Hawes House, his country home in Pocantico Hills, upstate New York, a building that was completed later that year. Although a Rockefeller Center committee rejected Léger's design for a moving multi-panel mural to be projected on a marble wall in the new building complex, the artist had other ideas for timely projects in New York. Before returning to France, he completed sketches for a design--again related to power transmission--for an exterior wall of the Consolidated Edison Building, then under construction in Flushing Meadows, Queens, for the 1939 New York World's Fair. In Léger's absence, workers completed the mural before the Fair opened in April, and from photographs the artist judged it a success (fig. 4). Both the building and wall painting were demolished following the closing of the Fair. Complementing the outsized scale of these murals, the still-lifes of 1938-1939 demonstrate Léger's program for the New Realism translated into more intimate proportions for daily domestic appreciation. Grande nature morte, painted in the largest easel-size format that Léger selected for these compositions, depicts an interior/outdoor setting which comprises a conglomeration of objects, including a potted leafy plant set atop a wooden plank, some fruits still attached to their vine, sections of fence posts, all woven together with branches, roots and tendrils. The result is a lively, sprawling, but harmoniously unified composition of objects projected as lines, forms and colors, consistent with Léger's long-held fundamental principle, by which he sought to "apply the law of contrasts" towards the realization of a "state of plastically organized intensity" ("Notes on Contemporary Plastic Life," 1923, in ibid., p. 25). Léger moreover intended his art to be both modern and accessible, animated with a lively profusion of elements, without any obscure content or message, and of unassailable formal clarity. Grande nature morte shows off these qualities to strong and immediate effect. He assured his viewers, "The work of art should not participate in the battle; on the contrary, it should be the resting place after the strife of your daily struggles, in an atmosphere of calm and relaxation where your developed sensibility will enable you to admire the works, the pictures, without compelling you to ask negative questions such as 'What does that represent?' 'What does that mean?'" ("Color in the World," 1938, in ibid., p. 130).